Since the first survey was completed in 1997, the market has grown from $6.2 billion to $9.2 billion, a 48.4% increase in 10 years for a slightly less than 4% compounded annual growth rate. The majority of that growth has occurred over the last 4 years, from January 2003 to December 2006. From 1997 to 2002 (6 years), it was basically flat, yielding only 1.6% overall market growth. The years 2003 to 2006 (4 years) have yielded 46% growth, or approximately a 10% compounded annual growth rate. It is safe to say, the “NIA World” has grown. Based on the survey methodology, $9.2 billion is a conservative number. 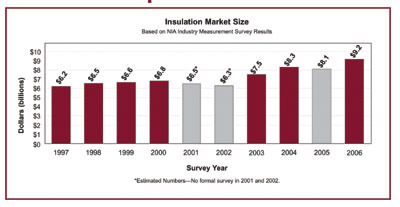 The survey does not include data related to metal building insulation (MBI); heating, ventilating, and air-conditioning (HVAC) duct liner; original equipment manufacturer (OEM) products; building insulation; refractory products; other specialty insulations; or insulation products or technologies not currently encompassed in the NIA World of mechanical insulation products. The value added by fabricators and laminators has not been accounted for, nor has the potential impact of imported products been included. The consistency of participation by larger manufacturers, combined with the consistency of tabulating the results, provides some comfort when examining growth rates for the mechanical insulation market segment. As with previous surveys, an informal survey revealed some changes that influenced the overall market size calculation and yielded some interesting information. The ratio of products flowing through the distribution channel versus being “sold direct” has remained constant or increased slightly. With continued consolidation and, in some cases, importers’ efforts to circumvent the distribution channel, the support of the distribution channel remains strong. The ratio of labor to material has changed significantly. It has changed to 72% labor and 28% material from a comparative ratio of 75/25 in 2004. The reason for the shift has been primarily attributed to a combination of greater productivity and the sustained price increases in metallic products. The mixture of the type of work and new construction versus maintenance activities would also have affected the labor-to-material ratio. Margins were flat to down for the distribution channel, while the contracting segment experienced a significant increase. The distribution channel had experienced some margin increase from late 2004 through mid-2006, but by the end of 2006 erosion of those achievements had started to occur. The increase in contracting margins appears to be driven by a shortage of labor, smarter work practices, and increased productivity. The data obtained in the NIA survey process does not provide detailed information to determine what percentage of the overall market growth was in units or dollars. That question was asked in the informal survey to which there were varying results. It is generally believed that dollar growth exceeded unit growth. Surveys can be a useful tool in all facets of the industry. The results can provide meaningful benchmarks upon which to measure performance or to establish objectives; provide meaningful and supportive information to shareholders, investors, and the financial community; provide current and potential employees with useful information; be used in developing strategic and tactical business or sales plans; and be used in reviewing historical trends, projecting future performance, and for a large array of other initiatives. This survey provides a 30,000-foot view of the mechanical insulation segment, which is a portion of the commercial and industrial insulation market. To those NIA Associate members that participated in the 2006 survey and to all of the sponsors (contributors to the efforts of NIA’s Foundation), thank you. The Foundation’s continual outreach effort to increase awareness of the value of insulation is making a difference. The industry is strong and has grown significantly in a short period of time. Was that growth driven by the general economy, the increase in energy cost and energy conservation initiatives, the increased focus on the environment, or the efforts of NIA’s Foundation? The answer is probably just a simple yes. When examining that growth question, it is interesting to note that each of the historical factors can also serve as a listing of future growth opportunities. These factors include the following: 1) energy and the environment are going to remain in the forefront in both the political and financial worlds for the foreseeable future; 2) the Foundation’s efforts are continuing and gaining momentum; 3) many industry segments of the market are forecasting growth over of the next several years; 4) maintenance activities are reaching the point where they can’t be delayed much longer; and 5) sustainable design activities are increasing. According to some economists, the general economy and the continual threat of terrorism appear to be the wild cards. The commercial and industrial insulation industry has confronted many obstacles in its history. It has always responded, rebounded, and grown over time. Our industry is strong and positioned to address the opportunities and challenges that present themselves in future years. NIA is looking down the road to your future and charting the course for success.